‘Transparency’, ‘ready availability of data’, ‘digital solutions through mobile applications’, and the like are all terms that didn’t exist in the jargon of the agricultural sector until some time ago – but they have turned into buzzwords today. Novel as the concept is and hi-tech as it may sound, at the bottom it actually contributes to improving the lives of smallholder farmers in agribusiness. Like most industries, the agriculture sector too is undergoing a sea-change and is coming ever closer to using technology to bring in transparency and efficiency with lots of innovations in the mobile and IT space, creating a huge impact on farming. SourceTrace is a pioneering company in this sector that has created a USP for itself with its ability to go to the first mile and last mile with equal ease. SourceTrace’s solutions can operate in remote locations to collect farmer, farm and crop-based information, recording them digitally and making data and analytics readily available to the management. This is the crucial factor that enables correct and timely decision making. SourceTrace also provides technology for traceability and certification solutions for various products that ultimately get farmer cooperatives into the formal agriculture sector fold, which is an important step in enhancing farmer livelihoods. Operating in these sectors so far been a great opportunity for SourceTrace to create social change, and it has also turned it into a viable business model. This has become possible because of its deep expertise and understanding in developing mobile applications; the platform ‘eServices everywhere’ has been developed over the years with a lot of investment. Aarong: Aarong is a social enterprise of BRAC that deals with retailing handicraft products sourced from small producers. A social enterprise would clearly require not just a social compliance program to be put in place, an efficient one at that. That’s when Aarong decided to digitize the entire process, for which, SourceTrace’ssolution was most suitable. This enabled transmission of data from remote areas, streamlining of data collection, provision of necessary support for management reporting, administrative functions and communication with producers. It increased efficiency and reduced cost of access to producer’s information and delivery of services. Aditi Organic Certifications Pvt Ltd: As a certifying agency for agricultural products, Aditi Certifications Pvt Ltd., the issue was of putting in place a digitally functioning internal control system and certifying process and discarding the out-dated manually operated system. The eSe platform was able to digitize the inspection process and provide centralized data for the management information system. Indong: Indong works with more than a thousand cassava producers in the Democratic Republic of Congo. Indong deployed SourceTrace’s applications to formalize and manage their farm base, include remote communities into the market, and procure the cassava. Through the use of this software, Indong has been able to formalize its relationship with isolated farmers and integrate them into the agriculture value chain. It has also had an impact by being able to generate revenue for remote rural communities and has also cut 40 per cent post-harvest waste! Dapasa: Dapasa works in palm plantations spread over more than 400 hectares. They used SourceTraces’s applications to geo-position palm plots and even weigh individual palm bunches. 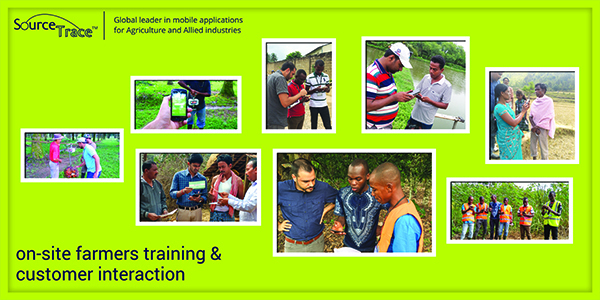 This application has enabled Dapasa to obtain precision-agriculture-like reports. Based on productivity, the application of fertilizers was adjusted, because fertilizer is one of the biggest costs in palm oil agro-inputs. The ST application also enables better coordination of harvest teams, depending on the number of palm bunches per plot. Some of the other customers include National Fish and Seafood, the world’s leading supplier/partner of seafood to major retailers, distributors, and institutional food service and restaurant chains. Here SourceTrace applications help with complete food traceability software of the production systems, right from hatchery to farms, inputs, harvest and processing. In another agency called LATCO in Bolivia, SourceTrace provides full visibility on the procurement process from the time the farmer delivers (sesame) seeds, until the bags arrive at the last warehouse. SourceTrace is also involved in sustainable development projects and market linkages for various smallholder farmers in countries like Togo, Benin, Congo, Sierra Leone, for coffee, cocoa, cassava and other crops. VenkatMaroju, CEO of SourceTrace, has a vision to make the company a 100 per cent social enterprise organization with a strong social purpose. Its goal is to create the world’s largest farmer database and targeting 10 million farmers in 2020. Currently there are 450 million smallholder farmers in remote areas of developing countries who are struggling in the most difficult circumstances to feed the world’s population while they are living at the margins. According to FAO, 70 per cent chance that the food we are eating is produced by small and marginal farmers in remote areas of developing countries. And these are the farmers that lack access to information, infrastructure and finance. Venkat believes that equitable treatment of these farmers, coupled with minimizing environmental impact of agriculture while at the same time producing food for a growing population is the main challenge for our generation. And technology should definitely be used to maximum advantage to address these issues.